Zip through the Gold Coast’s sparkling waters and sunny skies with a package that offers an action-packed jet boat ride and a scenic helicopter tour. See landmarks including Palazzo Versace Hotel, Marina Mirage, SeaWorld, Runaway Bay, Paradise Point, Sovereign Islands and Moreton Bay Marine Park. Your jet boat captain takes the vessel on a 55-minute ride with high-speed tricks that spin the boat around in thrilling circles and turns. 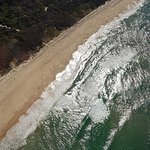 The 5-minute helicopter tour provides an aerial perspective on the region’s landmarks and beautiful beaches. Put on your life jacket and raincoat and take a quick photograph before boarding the state-of-the-art jet boat with your skipper, who provides a safety briefing before the engine roars to life. Hang on tight as you travel at speeds up to 40 knots (50 mph / 80 kph) while your skipper executes 360-degree spins, height speed drifting, beach buzzing, and other maneuvers on the Gold Coast Broadwater. You’ll cover more than 21 miles (35 km) on the water, passing by sights like the Palazzo Versace Hotel, Marina Mirage with its million-dollar super yachts, Sea World, Runaway Bay, Paradise Point, and up to the Sovereign Islands with their waterfront mansions. Return through Moreton Bay Marine Park, exploring mangrove-fringed channels and keeping an eye out for wallabies, dolphins, and abundant bird life. Getting wet is part of the fun, so make sure you’re dressed accordingly. Upon your return to the marina, you can view photographs and video footage of the boat ride, purchasing any you want to take home (own expense), and then head up to Sea World Helicopters for your 5-minute scenic flight over some of the same attractions you saw from the water: Sea World, Marina Mirage, Palazzo Versace, South Stradbroke Island, and the Surfers Paradise skyline. The order of activities is up to you, and activities may be taken over separate days, if you wish. When booking, the option you select is the date and time of the jet-boat ride. Thanks for your review, the jet boat and helicopter is our most popular combo. Great to hear you had a fun time on both experiences. 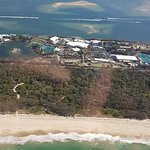 Get quick answers from Jet-Boat Ride and Helicopter Flight from the Gold Coast staff and past visitors.